Bubbles, bubbles, bubbles! When was the last time you looked into a child’s eyes, as you blew bubbles for them? I giggle watching my boys smile out of pure interest and race after the bubbles floating away. It’s like magic to them and always cheers them up. Could you imagine being completely surrounded by bubbles? Do not miss your chance to explore and play during Bubblefest at the Discovery Cube in Orange County this Spring Break. This event is open April 1st-16th. Make sure and bring the whole family to enjoy the endless fun. There are a few different stations to keep kids of all ages interested and smiling. It will surely be a treat for them. I took my 4-year old son, Piercen, for the very first time and was surprised walking through the venue discovering all of the unique, hands-on scientific stations, all about bubbles! Along with the stations, is the Mega Bubblefest Laser show by bubble artist, Deni Yang. I guarantee it won’t disappoint! Super talented, Deni Yang, holds two Guinness World Book of Records for fitting 181 people inside one bubble and creating the world’s largest bubble. Two extra perks of the show are that the kids get to sit in the front on the floor and have the chance to participate in the show. Yang is always walking around the stage and creating this insane bubble extravaganza, a bunch of bubbles within bubbles, large bubble tunnels nearly the length of the stage, etc. Every trick is even wilder than the last. While all of this is going on, many colored lights are moving around, and then the lasers come out. The theater room was full of these magical displays of colored lasers, firing up your imagination and creativity. It was hard to look away witheverything going on. Talk about keeping the audiences’ attention. The kids were ecstatic, clapping and laughing, cheering with mouths open in wonder. The very end of the show is phenomenal. The entire theater filled up with bubbles. Bubbles, bubbles, in your hair, bubbles, bubbles, everywhere! Before or after the show, make your way to the stations to explore and learn. The first thing Piercen wanted to do, was, of course, make bubbles, giant bubbles. There was a station outside just for that. The circle bubble wands were wide in diameter and lightweight, allowing even 1-year olds to try out. Piercen could fit in the bubbles he was making, it was extremely exciting to watch him create these massive bubbles that would float away. Want to run in a giant bubble? They have water spheres for guests four years old and older. Honestly, I saw far more adults doing it than kids. What a fun workout. Challenge yourself to race back to the starting line without falling. Bubblefest offers a five year old and younger gated section called Cube Jr. for the youngsters to sit down at tables and chairs to enjoy building legos, blow bubbles with wands and an interesting bubble frame that is pulled up to create a soap wall. The kids can push to create bubbles after they submerge their hands in the soap or try and blow bubbles outside of the wall. Next to the Cube Jr. activity center is the Cube Jr. playground where the kids can take their shoes off and run wild. It consists of an obstacle course jumper, low leveled and opened so parents can keep an eye on them. Piercen loved running through it and jumped around. Anybody up for moving laser beams? There is a Laser Table set up for two people to move different mirrors and lens’ around to redirect the lasers. Piercen loved shifting the mirrors and watching the lasers bounce around making different zigzag lines. Want to see your shadow in multiple colors at the same time? Check out the Color Mixing station and have at it. There’s a huge projection screen that displays different colored lights that shine on the same white screen; their wavelengths combine to create other colors. It was really silly watching Pierce’s three hand shadows. If you want to get even more scientific. Blow bubbles into the CO2 (carbon dioxide) Chamber. The air inside a bubble is less dense than the CO2, so the bubbles stay afloat and hover on top of the CO2 which is at the bottom of the chamber. At one point our bubbles were getting larger, and it was because they were filling up with the CO2. They started sinking to the bottom. It was my most favorite science experiment. Hexagon Bubbles was fascinating too. Blow multiple bubbles into the frame display and watch them connect to make different stable structures like a hexagon. We had two bubbles connect and form a perfectly straight line. Science rocks! Between all of these hands-on science experiment stations and the incredible show, you and the whole family will have an unforgettable experience. My son is already asking to go back. Bubbles, bubbles, bubbles, enjoy! Bubbefest is happening at Discovery Cube OC until April 16th. Tickets are $10 per person. 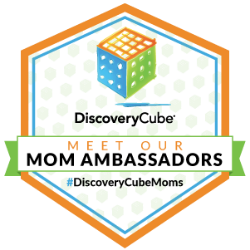 Discovery Cube OC is located at 2500 N. Main Street, Santa Ana, CA 92705. Honestly, you won’t catch me without a smile on my face. I am an easy-going wife and super patient stay at home mom, always looking to excite my busy boys with adventurous fun! We love to be outdoors running wild and getting dirty. My boys are pretty rugged, [so as a tom-boy myself], we are the best of friends. We especially love bike riding together, splashing around at the beach and hanging out with those who want to join in on the fun. After starting a family with my childhood sweetheart, Jarred, and becoming a mother to our sons, now 3.5 years old and 18 months old, I was given a purpose in life! I thrive to balance every day, as a sincerely loving wife, mom, sister, aunt and daughter. Family is everything to me.